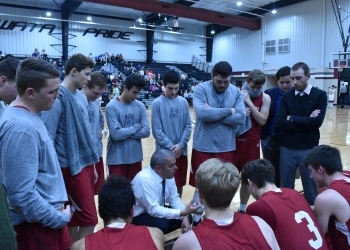 Dewey has now won four of its last five games after dispatching of Caney Valley, 80-68 on Friday night. The Doggers knocked down thirteen three-pointers in a ball game in which they led from start to finish. Dewey seemingly couldn’t miss from beyond the arc early as they hit six three’s in the opening period. The Doggers wouldn’t make a two-point field until six minutes into the game. Dewey led 20-14 after one. The Doggers used a 15-2 run midway through the second quarter to put the game away earlier. Caney Valley picked up two technical fouls during that stretch as frustrations continued to mount. Dewey was up fourteen points at halftime. Caden Baughn led the scoring charge for Dewey with 28 points thanks to some incredible outside shooting. This second half three was one of seven that Baughn made on the night. The lead would reach 21 points in the second half as Dewey cruised to its fourth road victory of the year. The Doggers are 7-14 on the year. Dewey will play a tune-up game against Caney, Kansas on Tuesday before next Friday’s district playoff game at Kellyville. Both game will be broadcasted on KRIG 104.9 FM.